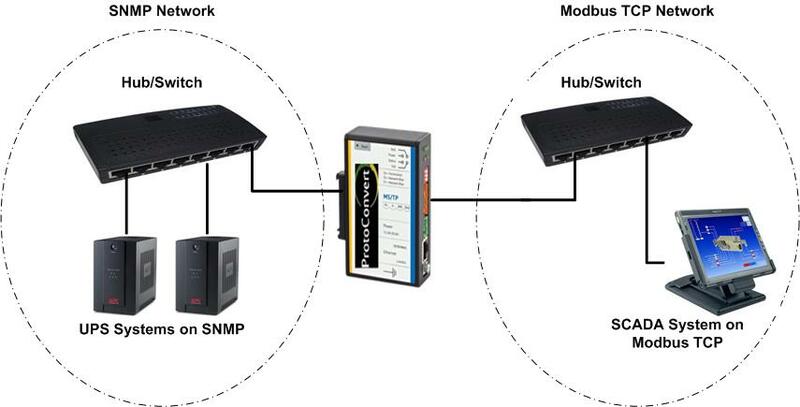 A great solution to interconnect SNMP Devices on other protocol Networks like Modbus (Modbus RTU, Modbus TCP, Modbus ASCii), BACnet (BACnet IP, BACnet MSTP, BACnet Ethernet), Lonworks, Metasys N2 and others. Between an SNMP network/device and a different protocol network like Modbus RTU, Modbus TCP, Modbus ASCii, BACnet MSTP, BACnet IP, Lonworks or Metasys N2. - ProtoConvert Lonworks Gateway models have a Lonworks port, RS-485 and RS-232 ports and an Ethernet port. Hence it is possible to interconnect devices on different serial and Ethernet protocols together. -Granular Traps: These type of Traps can be distinguished from one another because each has a unique identification number . The unique identification number is the Object Identifier or OID assigned to the Trap. When an SNMP Manager receives a granular type trap from an SNMP Agent it looks up the OID (of the Trap received) in the transaction file called the Management Information Base or MIB. Since each Granular Trap has a unique OID associated with it no actual alarm data need be sent with Trap. It can be looked up by the Manager from the MIB. This characteristic of Granular Traps helps save bandwidth because redundant information need not be sent with the trap and can be looked up the SNMP Manager. -Traps with bound variables: It is possible for an SNMP agent to send Traps for various events using the same OID. In other words, the same OID is used for the different trap messages. The trap message itself contains data pertaining to the Trap in a simple key-value pair configuration. Each key-value pair is known as variable binding.